It is becoming increasingly popular among companies, organizations and individuals to offset their carbon emissions from (for instance) air travel, car trips or energy use, by purchasing carbon credits from a carbon offsetting company. These carbon credits normally fund environmental projects around the world, often in developing countries. The idea is to compensate the amount of emitted carbon dioxide by, for example, planting trees or supporting water projects in developing countries. The buyer is then considered as taking responsibility for his or her emissions, thus contributing to sustainability and climate mitigation. We know that forests store carbon and considering that the forest cover in the world has declined by about half due to human activities, it would theoretically be possible to reduce the carbon dioxide level in the atmosphere by restoring these forests. Carbon offsetting does not reduce the actual greenhouse gas emissions. Each air travel or car trip has a carbon footprint. A climate benefit is only made if the trip is not taken. In the best case scenario the emissions can be compensated in due course, but the question is, how fast? Carbon offsetting is a tool in the international climate mitigation work. The UN's Clean Development Mechanism (CDM) is a so-called flexible mechanism of the Kyoto Protocol. 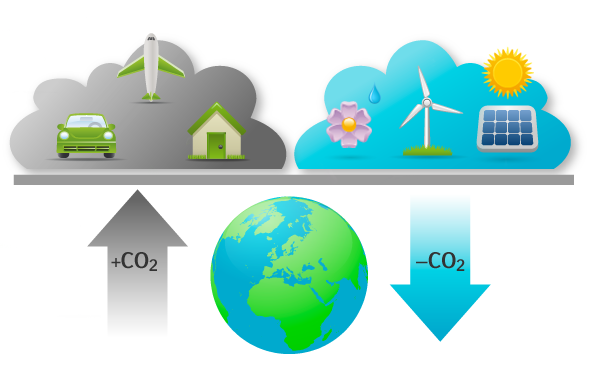 The CDM system is designed to allow industrialized countries to invest in projects in developing countries, by selling and trading so-called carbon credits (Certified Emission Reductions: CERs), in order to reduce their emissions of carbon dioxide. Each CER credit is equivalent to one metric ton of carbon dioxide. In practice, the CDM has not worked well. The rules are extensive and the administration has been time-consuming. The Swedish Nature Conservation Society concluded already in 2005 that many of the CDM projects up to then had contributed little to sustainable development in the host country. They had not led to any significant technological improvement either. Swedwatch and the Stockholm Environment Institute point out that the criteria for what is considered sustainable development vary between countries. Occasionally, the sustainability aspects of the projects are not followed up on, and guidelines for consultations with local people and other stakeholders are lacking. How can carbon offsetting be done? Plant trees that take up CO2 by photosynthesis. As long as the tree stands carbon is stored and many trees take up carbon for a long time. Buy emission allowances and remove them from the market in the E.U. Until 2011 the Swedish website utsläppsrätt.se sold carbon offset for no profit in this manner, but they ceased doing it because of the uncertainty on the effect on emissions. Invest in solar power that can replace fossil fuels. ETC offers such a service that presumes emissions should be fully compensated in 10 years. After this period the solar power contributes positively to energy production through substitution. For instance a return flight Stockholm - London would cost about 80 Euros to offset (April 2016). Climate compensation often means that rich countries purchase emission opportunities belonging to people in poorer parts of the world and this creates an unfair use of resources and brings colonialism to mind. By carbon offsetting, you can also buy your way out of responsibility and continue with the same behavior as before. No real change needs to be made on the ground or on a personal level. There are not enough resources in the world for everyone to have the same standard of living as the developed world. Read more on ecosystem boundaries. It is difficult to guarantee that trees are left alone for many decades in particular if planted abroad. Companies that offer carbon offsets often have an interest in making a profit. Thereby their motives and modes of procedure may be questionable. It can have the opposite of the intended effect. By climate compensation abroad as allowed in the Kyoto treaty the de-facto emissions have increased compared to what would have happened if climate compensation had been done at home. To start with, identify activities with an impact on climate change and calculate emissions, then head over to the solutions pages to get suggestions.